The Avengers International Fan Forum :: View topic - 1.07 - Target! 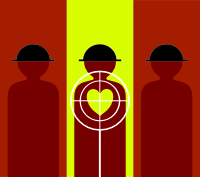 Posted: Mon Sep 23, 2013 9:11 am Post subject: 1.07 - Target! 10/10! The very best TNA. Rich. A sunny and fun story, suffused with genuine Avengers charm. It's a crying shame the great Frederick Jaeger was rained off and only appears in one scene. It's a corker, though, with Purdey demonstrating her reflexes by catching his pencil, behind her, with her boot. The Avenged? : A whole stack of agents, amongst others. Bruce Purchase in his British indoor "Amazon jungle" calls to mind the eccentricities of the monochrome Peel era. Lovely stuff. Bradshaw's horror, as Gambit unknowingly prepares to kill him, is a great moment too. Diabolical Masterminds? : Robert Beatty shows up mainly so that there's someone for Draker to kill: Keith Barron is fine as this soft-spoken, always-calm developer of the "killing machine." Deep Roy is magic as the murderous Kloekoe, especially in the tricycle scene and the blowpipe—leading to the way Gambit kills him (blowing his ice-dart back down his blowpipe!). All three work well together and it is refreshing not to see hordes of expendable henchmen. The Avengers? : One of the best for our dynamic trio, especially Purdey's ambition to beat Steed's perfect "100%, three times in a row" score. Purdey's full attempt on the range is great fun. Gambit is very good in this, no smugness at all. Umbrella, Charm and a Bowler Hat? : I love the Avenger mannequins (especially the "Steed" who repeatedly doffs his hat to victors on the range). Bizarre? : The curare is administered in bullets or darts made of ice, yet they do not melt in Draker's room-temperature office. The dummies do look and move too much like people in masks sometimes, but in the post-Cybernaut age maybe animatronics has indeed moved on that much. It also makes them suitably unnerving. The enforced under-use of Frederick Jaeger is recompensed with other fun telefantasy faces (John Paul of Doomwatch, plus Robert Beatty, Bruce Purchase and Deep Roy—important players in episodes of Doctor Who and Blakes 7 among other shows). It's well-directed, Ray Austin employing some great technical camerawork such as the curare-affected blurred vision, rather than relying on action set-pieces. And the police box is a nice touch. Yes. 10/10. One of the best of TNA. The scenes that are the best are Purdey doing target practice. Love the touches of graffiti here written about Purdey. Then of course one of the best Gambit scenes. I loved him crashing through the glass door and knowing that was really Gareth doing the stunt. I hear he was very proud of that stunt as he should have been. And then Gareth blowing the poison dart back at the enemy through the doorway was hilarious and quite effective. And the antidote being in Steed's bowler was quite Avengerish. Another good story. The location spotter in me was excited by the scenes along Nine Mile Ride, a road I travel daily. Another one I did not like on initial viewing and have since warmed to. The villains are top drawer, and their plot actually quite clever (though I'm unclear as to how it would actually be marketed, which is the whole point of the enterprise.) Each of the Avengers is used fairly well across the board, and I like all the little touches involving Steed's legend in the service. The final sequence is, of course, brilliant - as someone who adores Steed, I was pleased to see him fighting the curare all the way, given that it has killed younger and fitter men. I think he's a little underused throughout the episode, but not by much. My reservation about Gambit's reaction to Purdey's possible demise I've mentioned elsewhere and I still have mixed feelings about it. But otherwise, a very enjoyable episode and one of the few that feels like it could have been a "proper" Avengers plot. As well as Robert Beatty, Bruce Purchase and Deep Roy, all famous telefantasy figures in everything from "Quatermass" to "Charlie and the Chocolate Factory", I should've mentioned Roy Boyd as the doomed Bradshaw. He played a victim of "The Hand of Fear" in Dr Who, and the fabulous hero/villain "Zukan" in Blakes 7 (with pink hair). His death scene here is one of the best Avengers deaths (with plenty of Karma), and one of Gambit's best character scenes too. The Avengers finally got to demolish a telefantasy rival too, by blowing up Peter Cushing's "Dr Who" TARDIS. Great stuff in the episode that has the most Dr Who actors ever. Visually Target is the strongest New Avengers episode, and one that rivals the original Avengers in artistic terms. The very memorable set Target boasts does indeed echo the original show. In fact I'm really pushed to think of another New Avengers episode that features a set as prominent as this one, and one that is so relevant to the plot. The sewer set in the less popular Gnaws, the disused fairground in Hostage possibly, but none are as inventive and aesthetically pleasing as Target. The set is an artistic triumph and is one of the reasons it is so highly regarded. Of course if that was all this episode had to offer it would not be a fan favourite. The damsel in distress aspect is another pointer back to the glory days of the original show, with Purdey's life being very much at stake with literally seconds ticking away on the clock at the episode's exciting climax. Of course Purdey was in peril many times, but in Target a very personal element was added as Steed and Gambit were fighting to save her before the last second claimed her. Dead men are dangerous also had this personal element which takes the story to another level. I only wish the second season had delved deeper into this type of psychological territory, as I'm sure the series would have gone on for far longer. As it is, I think the first 13 episodes saw TNA peak all too soon, with Target being the absolute pinnacle of the show. Though I have to add that Faces is almost on a par, and is absolutely the most fun TNA episode to watch. If I was going to introduce a newbie to TNA, then Target would have to be the one, as it is the best constructed episode and the one that has best stood the test of time. 10/10. Rich. I grew up with Keith Barron on ITV comedy 'Duty Free' and it's still amusing to see him play straight. He's brilliant at stillness. He's cold and calculating. With The New Avengers there's often a sense that the department has seen better days. It's heavily nostalgic for the past - it's glory days when the world was more exciting. The training ground has that element; it's all run down and represents a world that no longer exist. Target gets that element right in that it still manages to enjoy the present whilst looking at the past. There are some episodes that feel rather wistful that the past has gone and they aren't especially enjoying the 'New'. For Doctor Who fans (or rather Dr. Who fans) this episode is significant as it sees the demise of the lovely police box prop from the Peter Cushing Dalek films. Yes there is something very reminiscent of The Avengers in Target. The red phone box, the police box, the often deserted streets and unusual buildings all contribute to this. Its also a bit like TNA episode Faces in that respect. As the title prepared me for, a lot of gunfire and resulting casualties ensue, so its often quite 'in your face'. This is I think my only real dislike and why I don't put it in my favourites. But Joanna is very good in the rooftop sequences and the feeling of who is going to succeed - Steed and Gambit or their adverseries - comes and goes rapidly, which is very slick. An absolute pleasure watching this episode again, and thank you to those people who suggested we start an episode review circle. It's The Avengers does a spaghetti western with a modern twist. The gunmen are automated, or at least remote controlled, and our heroes find that the practice range can pose as much of a danger as being out in the field - with the difference being that out in the field, the agents *know* they are in danger. Here, they think they are merely being run through their paces. It's a stunning episode, right up there with the very best of The Avengers, and one of a quadrumvirate of New Avengers episodes that are as good as anything The Avengers had to offer, maybe better: Target!, Cat Amongst the Pigeons, Faces and Sleeper. Target! gives us a greater insight into Gambit's feelings for Purdey than we'd seen previously, and treats us to a fine villainous duo in Keith Barron and Deep Roy, dark, cold and compelling - Draker and Klokoe. Diabolical masterminds for the 1970s. The direction throughout by Ray Austin is exemplary and packed with excitement, as it should be in the hands of someone exceptionally well-versed in stunts and action. Laurie Johnson's incidentals punctuate the action superbly, and the regulars are on their finest form. The New Avengers ultimately died with a whimper, but when it hit the heights like it did in Target!, it was a helter-skelter of thrills and I'm just so glad that I saw it back in 1976 on its first run. That first year of The New Avengers was what made me become a fan of The Avengers, and Target! has always been a treasured part of it for me. "Target" was the first TNA episode, which I have seen. It happened for a very curious reason: when Avengers series started to transmit in Russia on Channel TV6 on Sundays from 1 October 1995, in TV schedules on Mondays were listed the repeats of Sunday episodes, but once in November 1995 I decided to watch the episode, seems The Hidden Tiger, again, and what was my surprise when on Monday I saw the new cycle of the series, which did not know anything at all. "Oh my Steed - what is it - The Avengers of 1980s? ", I thought. Unfortunately it was the only single TNA episode that I saw then, in 1995, because when I turned the TV next Mondays, hoping to see and record the TNA on video tape, there were repetitions of the Avengers, already actually. So it seems there are only seven TNA episodes transmitted in 1995. It interesting to remember my first impressions of the episode. First thing, I felt, a marked difference from the Avengers style of film era: if the Avengers were filled by some tones of retro, due to the nature and hobbies Steed, manners of some characters, some of the sets, costumes, etc., in the new series - it's almost gone, mainly the world was presented as it could to perceive in the its time - the second half of the 1970s. Second point: it has become more serious and tough (now I realise, of course, episode Target is a real Action as genre, surpassing Dirtier by the Dozen (TNA) and Have Guns — Will Haggle from Tara King era). Third point: the plot and the dynamic were good approximated to Avengers position of color episodes. "Excellent. Big honor to the creators of a new cycle". The story, performance (despite small shortcomings) and directing captivated me from the beginning. I think, Action was one of those genres that almost in all cases successfully managed to embody in the series (not the fights as a component of series, but namely the Action as whole), in contrast, for example, from sci-fi. The prologue episode on the shooting range was well edited - do not give to relax for firther events. Сommemorative set of shooting range - brick buildings with inscriptions, mechanical manequens, phone box, buggy, etc. This indicates a good fantasy. Sometimes when I see the standard professional shooting range in the movies, it can be boring even if the scenes is well placed because you are passionate about only stunts and action (that is, under these conditions, you need good portion of fantasy of authors for stunts and action). But if we take the set for the shooting range in TNA, then you can see - if only focus on the action, you will see the flaws immediately that agents sometimes slow on the uptake in the crucial moments, and sometimes do stupid things (for example, to shoot at random in the window, where a dummy already "out"? ), so if there was choice of "dull" set, we would have a very different feeling for episode in whole. That is, in current case, now I realize that the set and props as first things gives the number of positive grades for this episode from my opinion. After - Action. Keith Barron as the villain is very good, the appropriate type for such role. Though the appearance of Draker resembles calculating cunning villains of the many films in the area "crime in the city", whether it be the illegal trade or political motives, but it is some right approach for this episode, I think. It adjusts to the desired way - the prologue showed us a City Action and if the villain would looked like person very stands out from the crowd, I would have thought that I was waiting on something in the spirit of the "comic Action book" than usual Action, which episode Target is. Draker confidently keeps the situation under control, he smart, cold-blooded, he directs his thoughts so that you think that this man is more dangerous than it seems, as result, when I analyze of Draker, I am so sure in reasonableness and reliability of his plan, I'm starting to really fear for the heroes. Seriously - I can not imagine how such a person can be "driven into the trap" of only trio of people. Draker is very dangerous, exactly because he no "comic book villain" (fiction, we do not believe), but man as if in real life. And it is more scary! In my opinion, Draker is one of the best villains in TNA, in TOP 5. But back to topic... As often happens, the heroes find a way to split even more stronger nuts and in these cases comes an admire "They are real experts!" Separately, I want to say about Kloekoe, which was very suitable for duo with Draker, and even evoked some sympathetic thanks to actor Deep Roy. Agile executive shorty, capable of being invisible in certain places and to play the role of children. He made the episode more intriguing by his tricks and professionalism. When Steed could not escape his cunning, we are not sure for Gambit, who along with friends enters into an unequal battle with the villains in their own territory. Real intriguing moment, when Gambit goes straight into the trap of Klokoe. "Oh, no!". In whole, I loved to watch the final stage of Target separately. Episode is also good for its saturation, he is not marking time, in 50 minutes happening many events. I like the touch here to triangle relationship, in current case are Purdey, Gambit and Myers. It is so well "written", that when I watched the episode for first time, I even forgot about the main story, wondering how relations will develop in the future. However, the situation with a Myers quickly resolved. Target is one of my favorites of TNA. Attractive hour. The episode made a big impression on me, as a result of the summer of 1996, I, along with his cousin and uncle played a game called "red dots" in countryside. It started with the fact that I told the story in detail about the episode, and then we went into the forest with sticks as a weapon and began to hunt each other. Well, we did not use paint or something like red dots, but simply ran through the woods, and when detected the "enemy" we shouted something like: "Shot, you have a red dot". It was necessary to get to the enemy several times before he would was out the game. Our uncle was the most experienced, a real partisan, he managed to hide so that jumped out at us in unexpected places. By the end of the game, I and cousin become to work together of hunting for him, but suddenly our uncle jumped as if from the underground and shouted, "Boys, you're in the red points - your minutes are numbered". This was fun day. It's great to see that this episode is still one of the most popular TNA episodes. My favourite scenes are the ones where the three agents attempt the target range in their very different ways. Patrick Macnee did complain of being left out of the action during season 1, which he felt was due to the producers doing him a favour in consideration of his 54 years of age. He said he did feel he could do more, which he of course did in season 2, but at least in Target Macnee was involved in much of the action. Gambit's attempt, as already pointed out, was probably Gambit's best action scene in the whole run. I also love Purdey's attempt, particularly when she shimmies up the drainpipe and walks across the roof. I also love Gambit's neat way of disposing of Kloekoe. Possibly the best villain disposal scene in TNA. No matter how often I watch this one, it's still one of my least favourite Avengers episodes of all. It does have a few things in its favour such as good location choices and an impressive guest cast, but the connection between the deaths and the training course is so obvious from the start that the leading characters' inability to see it pushes my credulity too far. Even after Gambit has seen a fully healthy man that he's playing a practical joke on, actually shot him himself with the same guns all the other victims had been in contact with, and then sees him die in front of his face... he still can't work out the connection, even though this sequence of events takes mere minutes and nobody else was present. I hate to see our heroes written down so much, and it hinders my appreciation of whatever other qualities the episode might have. Always has done, which is a shame when the production has so many recognisable cult television actors on show. If I had been the producer, I would have started the run with Target! instead of The Eagle's Nest. It has everything that The New Avengers was supposed to be, but didn't always deliver. We start with a location evocative of the Sixties England that was so much a part of The Avengers, so any nostalgia on the part of the audience is immediately invoked. But, something has changed - the buildings, upon closer inspection, are dilapidated, with broken windows and graffiti on the walls. Here we see a physical reminder of the malaise of Seventies Britain. A flurry of deaths, each one impressing the connection between the training range and their mysterious deaths - The Avengers often relies on dramatic irony, the audience one step ahead of our heroes, and it is done well here. I particularly like Ray Austin's direction, with his extreme perspectives and wide depth of field. He was lucky to have Jimmy Allen in his crew. On a meta level, I love that some of the mannequins are Gambit, Purdey and Steed (played by them in white maquillage). Is it saying that our heroes are not to be attacked? Or they are their own worst enemies? Keith Barron is superb as the cold villain who eventually turns on his own superior when his judgement is questioned, although I fear new viewers will rarely see this episode because Mr Barron doesn't want it broadcast (or so I believe). SD is right - the time it takes Gambit & Steed to put one and one together is frustrating but it's the only weakness in the episode for me. However, as Dr Kendrick points out, a lethal dose of curare is unknown in Britain and outside Agatha Christie (and this, and a Doctor Who story) you would never have known that a tiny pinprick could be capable of killing someone. I did think, on rewatching, that Gambit ought to have bloody walked over and looked inside the hat there and then, though! There's one lovely cut away which encapsulates this episode for me: Gambit is on the range and he realises the enemy have activated the mannequins. A figure appears and he shoots it, then discovers it's a Steed dummy. He mumbles an apology and then we cut to Steed, who has stumbled out of his car, clutching his side - exactly where the dummy would have been hit. The target range itself is such a visual delight and is both set and location. I love Deep Roy's silent henchman character. It is also one of those episodes where we see why the headstrong younger leads still needed Steed's experience. The New Avengers is too easily dismissed by some Avengers fans and this is one of many episodes which demonstrate what the new series had to offer. Alex is right to point out the plot weakness, but doesn't every Avengers episode have these? The show has always been far more to do with visual appeal and style and Target certainly has these.